The two adults in this 2.5″ x 1.5″ tintype are my grandparents Robert Benyon (1842 – 1906) and Mary Fennah (1846 -1944). 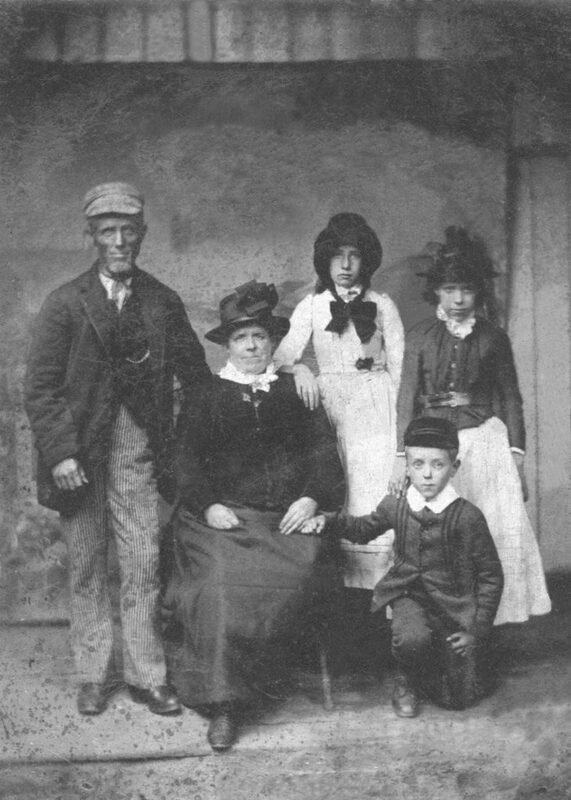 It is not clear to me which of their 8 surviving children are in this photograph with them. I suspect the young boy in the front may be a grandson. The 1871 census has Robert’s occupation as Labourer. Between 1881 and 1897 Robert’s occupation was Coal Dealer. The tintype process or ferrotype process evolved from the ambrotype. It was invented by Prof. Hamilton Smith of Ohio in 1856. This entry was posted in Benyon, Fennah by Tony. Bookmark the permalink. That's kind of a cute picture in that it is the dad that is smiling. So many times the father looks more severe in the family photo. I read your comment on my blog and noticed that you said you had only been blogging for five weeks. From the look of your blog, you look like a pro. Welcome aboard! This is such an interesting photograph: at first glance I thought it was one of those modern photographs with people dressed up in old costumes. I was thrilled to read it was a real old photo – and surprised to see that the original was so small! Here are my guesses: the parents look like they could be in their 40s, which would put the date of the photograph mid- to late-1880s. (Of course, people aged faster and looked older sooner when this photo was taken, so they could be younger.) The girls look like they could be 14 and 12, and the boy could be about 8. But as I go back to your information to look at the ages of the girls (there are only 4) and a younger brother, I don't see any children who could be these. Martha's next youngest sister is 10 years younger and all the rest of the girls are younger still. What a puzzle you have! It might help if you could date the clothing but because they are a laborer's family, their styles might not be up to the minute. It's too bad your grandmother didn't identify the children! Maybe the photo was taken earlier. Is it possible any of these children are ones who died before adulthood? Maybe another descendant of one of your grandmother's siblings will find the photo and know something more. I hope you can learn who the children are! Thanks for becoming a follower of my blog (My Ancestors and Me).